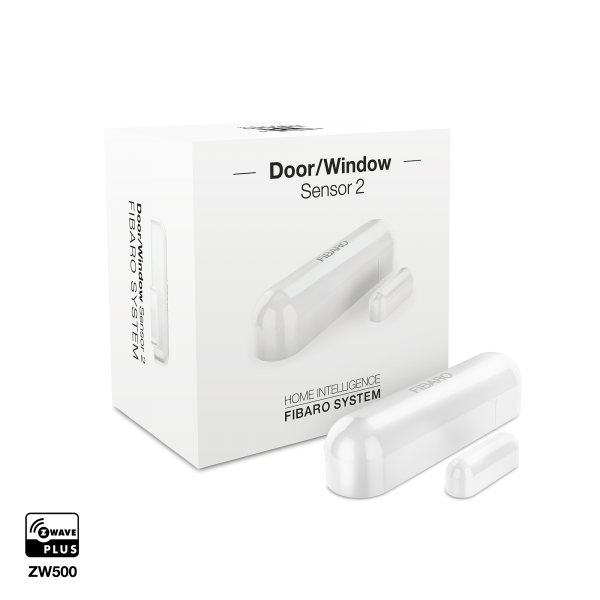 Product information "FIBARO Door/Window Sensor 2"
The FIBARO Door / Window Sensor 2 is a battery powered, Z-Wave compatible reed sensor. It combines the functionality of 2 devices (reed and temperature sensor) in one easy to use product. The sensor can be used for monitoring whether a door, window, window blind or a garage gate is opened or closed. In addition, the fix integrated temperature sensor measures the temperature where the sensor is installed and reports to the Z-Wave control center. The product consists of two elements. One of the parts is mounted on the moving part of the window or the door. The other part is placed on the frame. The device needs to be included into a Z-Wave network by a remote control or any other Z-Wave controller. If an action is detected, the sensor sends a signal to the Z-Wave network main controller. Compared to its predecessor the FIBARO Door/Window Sensor 2 has a more compact and rounded design and the fix integrated temperature sensor. But the freely useable binary input is no longer available. Related links to "FIBARO Door/Window Sensor 2"